Need A Mini Skip, Fast? A bit too much rubbish or rubble? The complex you live in won’t let the big trucks in? Tired of waiting for the municipality? Introducing the 2m³ & 3m³ Mini Skip. We’ll drop and collect for you in the greater Vereeniging, Vanderbijlpark, Sasolburg and Vaal triangle area. Looking for the Vaal Triangle's preferred skip rental company that’s reputable and affordable? 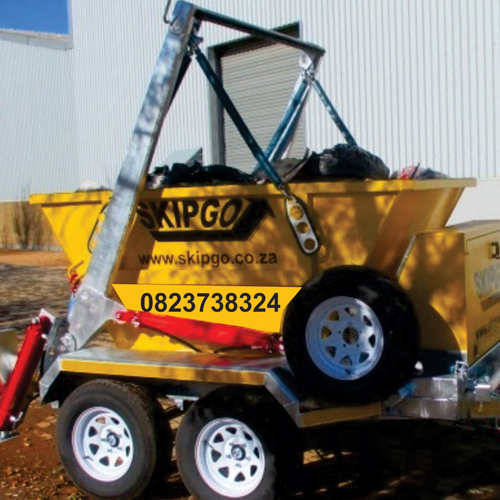 At SkipGo Vaal we make skip rental and cleaning service simple, cost effective and convenient. Your local hardware does not deliver small loads! We also deliver your pallet sized loads of bricks, tiles, and cement, 2m³ & 3m³ sand and stone. We drop, You fill, We collect OR We clean, We fill, We clear. Great Low Prices - Competitive pricing on all mini skip rentals. No hidden surcharges of any kind! No cash at home? Don't worry- we even accept Credit Card payments on the site! Flexible Rental Periods – We offer anywhere from 1 day to 21 days standard rental periods. Service available Mondays to Saturday. We also offer a monthly rental period, with 4 inclusive bin services. Easy Online Ordering – Fill out our contact form and we will get back to you within the hour with a full quote. SkipGo Vaal is a proud supporter of the “Unashamedly Ethical” campaign. This is an independent South African initiative promoting ethical conduct in both personal and professional lives. It is based on a belief that as we re-align our moral compass to defy corruption and self-serving business practices and instead promote value-based trading, ethical leadership and fair and just treatment of all in the business arena, then it will have an impact on our personal lives, communities, our nation and our continent. A bit too much rubbish or rubble? The complex you live in won’t let the big trucks in? Tired of waiting for the municipality? Introducing the 2m³ & 3m³ Mini Skip. We’ll drop and collect for you in the greater Vaal Triangle Area! Looking for the Vaal's preferred skip rental company that’s reputable and affordable? Competitive pricing on all mini skip rentals. No hidden surcharges of any kind! We offer anywhere from 1 day to 21 days standard rental periods. Service available Mondays to Saturday. We also offer a monthly rental period, with 4 inclusive bin services. Fill out our contact form and we will get back to you within the hour with a full quote.